A two stage air compressor is an exceptional option for commercial operations that need to balance power and cost-efficiency. 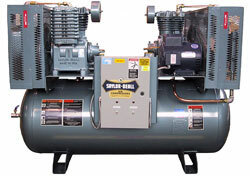 Two stage air compressors can store compressed air, meaning they don’t need to run continuously to produce it. This can significantly lower the energy consumption in auto shops and manufacturing plants that utilize compressed air for extended periods of time. While these compressors keep costs low, they still produce all the power needed to operate industrial air tools. Whether you need a two stage or a single stage air compressor, our knowledgeable, certified technicians can help you find the new, used, or refurbished compressor that suits the size and power requirements of your space and application. We also provide compressor repair and maintenance services at affordable rates, and rental services for Nashville, Knoxville, and throughout Tennessee. Contact A&W Compressor today for more information.